The idea of motels and what they entail has always fascinated me. A temporary stop during a road trip, a place to do what you might not want to or can't do at home, motels have a constant flux of different characters moving in and out, sleeping night after night in the same bed, watching the same tv. I'm interested in the narratives that exist in these places: the mystery, drama, and even the mundanity. 1:02am is an image of my first motel sculpture, titled Motel. Motel became my muse for awhile, as a setting for many photographs I made that year. I took the motel to Red Rock Canyon, near the Mojave desert, to do the shoot. The seemingly looming mountains in the background are really only about 15 feet tall. 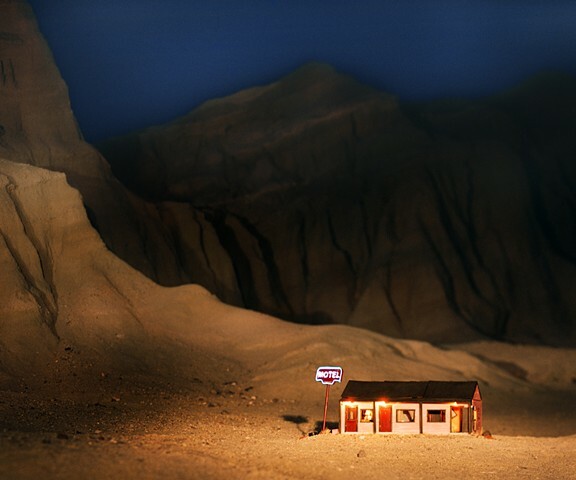 The small mountain range and motel are painted with flashlights. Shooting with a 4x5 camera, I travel to locations, both local and afar, blending the sculpture in with real, life-size landscapes.